I’ve gone very minimal with my road bike tools (the ones’s that I carry with me when I’m out on a ride) – the bike is well-maintained, I’m not heading into the wildernees (it’s a different story on the mountain bike) and I’ve always got a phone with me if the worse happens (assuming that I’m not stuck at the bottom of some valley out of mobile coverage). So I’ve ditched the fully-blown Topeak minitools and have started to carry a Crank Brothers m5. 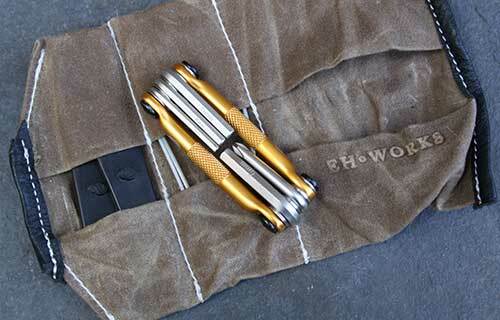 Not only is the Crank Brothers tool quite striking in anodised gold, but it carries the right selection of tools for most road bike repairs – Four Allen keys (or hex wrenches) in 3mm, 4mm, 5mm and 6mm, plus a Phillips head screwdrivers. 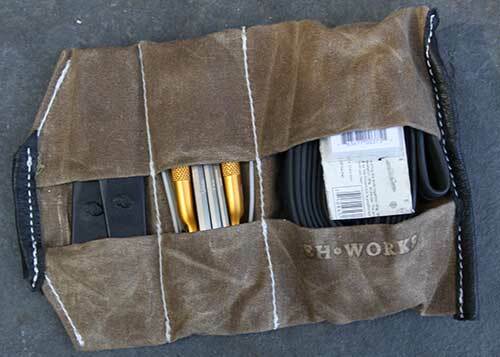 It’s also a perfect fit for my new E H Works Essential tool roll.